Enjoy Tony's story as he tells you how he and his 10 acre private garden went from essentially seedlings to maturity during the past 50 years. He will explain the importance of designing with long term relationships in mind, not only for the garden but also for the gardener. Tony's stunning, mature landscape in Harwood, MD, features not only azaleas but an array of choice companion plants that make it truly a garden for all seasons. 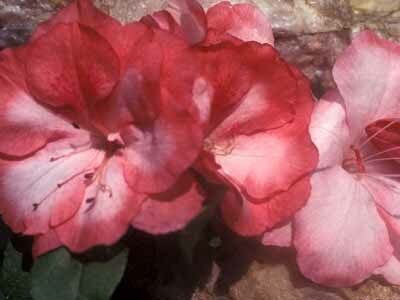 Tony Dove was the Past President of our Azalea Society of America in 1985. Following his 1969 graduation from the University of Maryland with a degree in Environmental Horticulture, Tony designed and constructed the lovely London Town Gardens which you may have visited during the 2004 ASA Convention. Since that time, Tony has has held a number of prestigious positions including Chief of Grounds Management for the Smithsonian Institution in Washington, DC. He now serves as the Horticulturist for the 3000-acre Smithsonian Environmental Research Center in Edgewater, MD. One of the first local Northern Virginia azalea hybridizers, Pete Vines will talk about his development of the Holly Springs evergreen azalea hybrids. 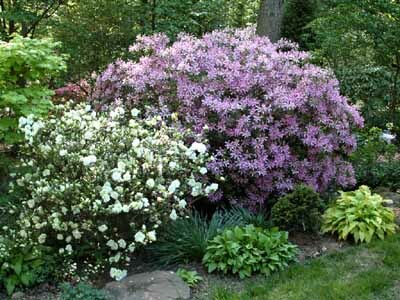 Although Pete has since retired to Amelia Island, FL, he has left behind a legacy of superb azaleas that are valuable resources for both the landscaper as well as the collector. Pete Vines is a retired Army Colonel who did much hybridizing at his former home in Fairfax County in Northern Virginia. He ran a small nursery there before moving to his current retirment home in Florida. 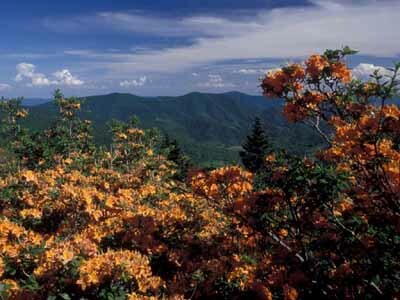 John Brown and Bob Stelloh will share beautiful images and personal experiences about Rhododendron vaseyi in the Southern Appalachians. 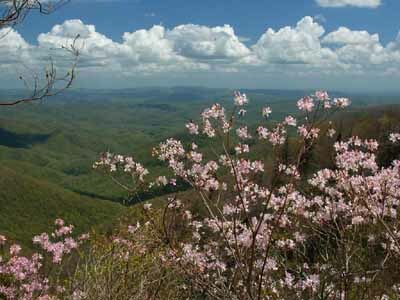 They will show Pilot Mountain with its impressive stand of R. vaseyi, the Southern Highlands Reserve which has an even larger stand, and a variety of other locations between them. This native azalea is one of the more rare and beautiful of our native species, and the namesake of last year's ASA Convention hosts, the Vaseyi Chapter. John Brown and Bob Stelloh are two of our most cherished leaders in the Azalea Society of America. John is our current ASA President and Bob is past Treasurer and Webmaster. Both men have explored remote locations in the Southern Appalachian Mountains seeking rare populations and superior forms of R. vaseyi. They have kindly agreed to fill in for our previosuly scheduled speaker, Clarence Towe, who has had to cancel for personal reasons. From Cape Breton in Nova Scotia, to the Appalachians of North Carolina and Tennessee, to the Northern Rockies, to Big Sur on the California Coast, George will take us to some of the most scenic spots in North America as he celebrates our native flora. Not only will he discuss the amazing differences among the diverse native plant materials that inhabit these locations but will also point out some amazing similarities. George McLellan is an expert photographer and recent recipient of the Silver Medal from the American Rhododendron Society. 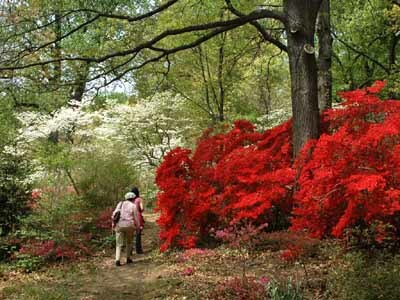 He has spent much time pursuing the study and documentation of our native azaleas and is a sought-after landscape designer whose expert work can be seen in prestigiuous gardens from Richmond to the Northern Neck of Virginia. 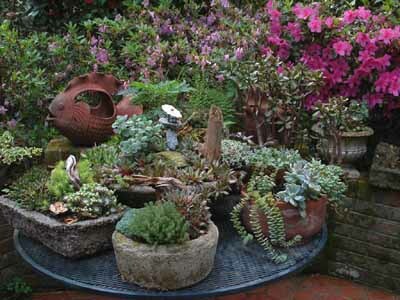 One of the grand ladies of the ASA, Rosalie Nachman will combine her expert gardening advice with her delightful sense of humor as she shares mistakes and successes in developing her private garden in Richmond, VA, over many years. Be prepared to laugh with her as she teaches us all valuable lessons in life and in gardening during this most memorable presentation. Rosalie Nachman is a life long gardener. She is a past Board Member of the Azalea Society of America and also served on the Board of the Middle Atlantic Chapter of the American Rhododendron Society. She is sought by many not only for her horticultural expertise, but also for her clever wit and endearing personality. Don's presentation will be a modification of the program he presented at the Edinburgh Botanic Gardens in 2008, a celebration of the beauty and diversity of the Evergreen Azalea. Beginning with a brief history of this long-cherished flowering plant, he will discuss some of the contributions of pioneers in the field like Gable, Morrison, Creech, Kehr, and others before acknowledging some of the more recent and stunning accomplishments of current hybridizers. He will then challenge us to look to the future so we tap the still unrealized potential of the evergreen azalea. Don Hyatt is a retired computer science teacher who has had a life-long interest in gardening and plants of all kinds. He has served on the ASA Board and is a recipient of the ARS Silver Medal. * Amended February 23, 2009.